Welcome, I am so happy that you stopped by. 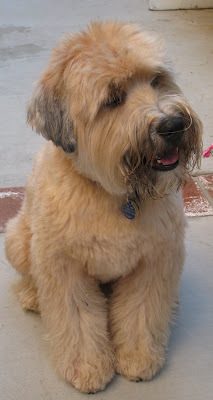 We are having "dog days of Summer weather" in Southern California - hot and unusually humid. Most of my paintings are inspired by the ordinary and every day objects in my home and garden. As I opened my French doors this morning to let in the summer breeze I saw the beginning of a painting. Pour yourself a cool drink and I will share my inspirations with you .We will find my studio assistant, Bentley, already in the garden helping out looking for inspiration. I picked up the white wicker recently at a yard sale wile driving out of town for a "mini" road trip and plan to use it in my guestroom. I am re-purposing my guest room using everything I already have by using Kitty Bartholomew's philosophy . . ."it's not what you don't have . . .it's what you do with what you do have". The white wicker chair with blue stripe and floral cushions and French doors inspired my guest room painting since the room has some blue stripe bedding . . . I added the sunflowers for a pop of color . . .a basket of red roses to pick up the red accents in the room and a bright blue rug to pull everything together. My home is decorated in what I call . . "re-purposed seaside cottage garden style " . . so . . I decided to paint the ocean in the background to tie in the seaside cottage garden theme. I am off to hang the painting and finish re-purposing and will show you the finished room next time. Thank you for visiting. I love hearing from you and sincerely appreciate that you have taken time to leave me a comment and follow my blog. If you have any questions or would like to see me paint something special, please leave me a comment or send me an e-mail. What a beautiful blog - your photos are wonderful as well as your art fabulous. What talent. I love French doors and your provided the perfect setting for a painting. Thanks for sharing. Your french doors are so pretty, and the picture of your frech doors is just as pretty. You have been so blessed to have such a beutiful talent! Gorgeous, Gorgeous, Gorgeous! Oh how I love the colors in your painting pallet, and the subjects that you paint. I love your work, and I love your dog. How lovely can you get. Your art is georgous. I've been following your blog for a while and am continually amazed at your gorgeous photography and paintings! I just added you to my little miniature blog roll too. I'm working on a beach house dollhouse. I'm finding lots of inspiration here and wanted to share you with my mini-friends! That painting is wonderful. I love Kitty too. I wish she was still on HGTV. Congrats on the Cottages and Bungalows press!! That is awesome!